Tonight, in honor of reaching the 10,000 view plateau, I chose a cap that, despite its quirky, cheesy quality, happens to be a favorite of mine. The Lansing Lugnuts are a Single A franchise which plays in the Eastern Division of the Midwest League. The Lugnuts, who have been known as such since 1996, have been affiliated with the Toronto Blue Jays since the 2005 season. In the past, the ball club has been part of the Chicago Cubs organization from '99-'04 and the Kansas City Royals organization from '96-'98. The team, which calls Lansing, Michigan home, plays their games at Cooley Law School Stadium. The park, which was originally known as Oldsmobile Park in recognition of Michigan's automotive prowess, seats a resounding 13,527 when the lawn seating is filled to capacity. This park not only serves as the home to the Lugnuts, but also the Michigan State Spartans of the NCAA. These two teams have competed annually since 2007 in a game which is known as "The Crosstown Showdown": a game which pits Professional vs. Amateur in a competition of talent. In the 5 previous games, which were meant to mostly involve the collegiate community and give collegiate athletes to play on a professional level, has been won by the Spartans twice in five games. The event impressively drew 100 fans short of 13,000 in 2009. The Lugnuts, who have had a somewhat unsuccessful past, have only won 2 league titles in '97 and '03, and only three division titles in '96, '99, and '08. The Lugnuts have had a few former players who have made it to "The Show"; Some of these players are: Carlos Beltran, Felix Pie, Mark Prior, Travis Snider, and Carlos Zambrano. Despite their lack of titles, the development of players who can hack it at the next level certainly seems to be one of their strong suits. This cap, which I found HERE at Lids.com, features a black crown, black brim, and a cartoon version of a Lugnut (no need for explanation here). 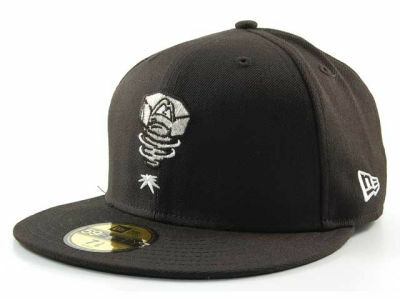 To me, it's a clean cap which embodies the playful nature of Minor League Baseball. Maybe the franchise can provide some proverbial torque to the competition, and make a run at the top. The Lansing Lugnuts are currently in first place with a record of 27-18, so keep it up guys. Maybe you can even beat a NCAA team this year...if you know what's good for you. Love this hat. I wonder what the jersey looks like. Just how long can my computer keep running with the outdated browser?